The black fabric panel is a superfine merino knit from The Fabric Store. The white jersey is a DKNY knit I picked up a couple of years ago also at The Fabric Store. Its heavier drape means it is quite opaque and I don’t have to worry about my bra showing through. I know, I know. I’m getting quite conservative in my old age! A wardrobe basic with sass. I’ve had a number of peeps ask about the Ensis already. The colour blocking is a cute feature. How snug it is. Merino 4 lyf! A quick project. Anything you can sew up between breakfast and a lunch cheese plate is a win in my book! Carve out that neckline. My lady cargo does not love a crew neck (and neither does my neck- ugh I’m being strangled!) I used the Scout tee neckline for my last Ensis and it is perfect. Will revert back to that regular programming next time. I’ve got nothing else. This is a simple wardrobe staple. Overall, I’m super happy with this simple make. 2015 seems to have been a wardrobe building year so far (a tulle skirt is a wardrobe staple, right?!) so the Ensis slides in perfectly. I’m hoping to have my jeans fitted and finished soon so it can rock it with the Ensis for a perfect brunch outfit while it is still freezing here. Brrr! And a bit of a life update- things have been super tumultuous here at Chez Bimble + Pimble for the past four weeks. Our two piggles, Rumble Pig and Hammford P. Pig, both passed away within the last month. We’re missing their little squeaks and my sewing room is quiet without the two of them supervising me at work. Added to that Miss Bimble somehow managed to rupture her ACL and went in for a puppy knee reconstruction last week. She’s healing steadily and we’re well on the way for her three month recovery complete with ice packs, physio and massage (it’s like being injured from derby again!) She may be injured, but she still is cute! Oh, and Pimble got a chew stick and pretended to be Winston Churchill. Crazy times at Chez B + P! Great tee! Black and white: classic chic. I need this pattern! I need a coverstitch too! Inna, the overstitch was cray-mazing! Serious game changer! You should get a coverstitch machine. I didn’t need one either, until I got one. It machines slinky knit hems like a boss. No ripples! Ohhh, slinky hems! That is luring me in even more! I love this shirt. It’s on my list of to sews now, it just looks so cute! I’m sorry to here about your little piggies – it’s so tough losing pets! Sending you hugs and lots of healing vibes to Miss Bimble! Winning at the tee making. I must revisit this pattern… Thanks for the scout neckline heads up. I’ll be copying that idea. Excellent black and white tee, and that coverstich! perfection! is it wrong to covet a coverstich and is there a verb for that? I would buy this shirt in a second if it were in a store. It looks great! Sorry about your little sweeties and I hope little missy gets better soon. Isn’t it such a workhorse tee? So happy with it 😀 And thank you for the kind words, Diane. 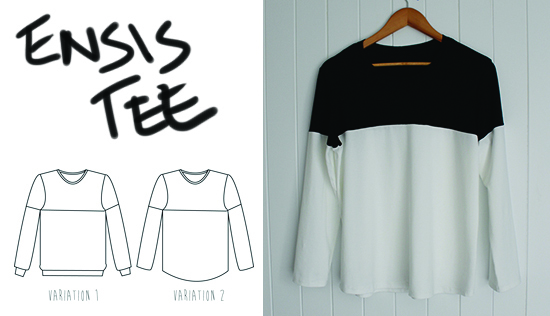 What could be better than a classic black and white colour block tee! Love your work on this one. I can’t tell you the number of these t-shirts I’ve made. It is a strangely versatile pattern for such a simple design. Love the black and white. Yeah, black and white… classic and modern… simple but special. Always be my favorite. Thank you for sharing.